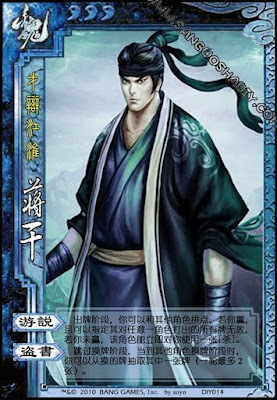 During his turn, Jiang Gan can compete with any other player. If he wins, he can make the loser's cards ineffective against any player for their next turn. If he loses, the other player can immediately attack Jiang Gan. Jiang Gan can skip his drawing phase. Before his next turn, he can then take one of the drawn cards from up to two other players. Jiang Gan can protect himself with "Intermediary".